Are Fans Crabby About 'Chabby' Leaving Days Of Our Lives? Are Fans Crabby About ‘Chabby’ Leaving Days Of Our Lives? We’re devastated, a whopping 93% of you choke out through tears. Chad (Billy Flynn) and Abby (Kate Mansi) are one of Salem’s hottest couples. They’re both from major core families, and you were looking forward to them raising the next generation, Thomas and Charlotte, not to mention breaking up and getting back together at least a dozen more times. When Chad leaves, that leaves the DiMera empire in Stefan’s (Tyler Christopher) hands, and that won’t be good for folks like Gabi (Camilla Banus). And, when Abby leaves, that’s one less person who can help Jack (Matthew Ashford) remember who he really is and get him away from Eve (Kassie DePaiva) and back to Jennifer (Melissa Reeves). Say it ain’t so, Chabby! They’re a tiny minority, but 7% don’t care about this couple and will be happy to see the last of them. Abigail was never properly punished for the crimes she committed while acting as “Gabby,” and Chad proved his worthlessness when he didn’t defend her. They split for a reason now, and you know it’s only a matter of time before they split up again. But they might as well do it off-screen, where you won’t have to be bored by it – again. Maybe they can come back in five years or so – with teenaged Thomas and Charlotte. Days of our Lives (DOOL) airs weekdays on NBC. Check your local listings for airtimes. 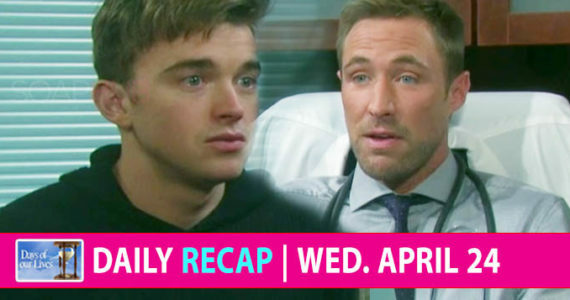 Chad Drops A Bomb On Ben As JJ Confronts Gabi!